You’ve hired a decent PA system, you connect up your laptop and start playing music but it doesn’t sound right. The sound isn’t crisp and the bass is lacking. You try another song and it sounds the same. What’s wrong? Your first thought is to blame the PA system but wait a minute. Let examine your music files. Where did you get them from? It’s very unlikely that you’ll experience any sound quality issues. The ideal bit rate for ripping a CD track to MP3 is 256kps or above. Music ripped at 128kbps should be avoided. Music ripped at lower rates will produce low quality output when played at high output levels. Illegally downloaded it or someone gave it to you. Whether it was illegally downloaded or you copied it off your mate’s computer, the quality may be suspect. It’s fairly common to find 128kbps or lower bit rate format music on download sites. Don’t laugh, this is very common. The easiest way to get the latest tune you like, is to record it from YouTube. Even with the newer format HD video, the sound quality isn’t adequate for playing loud music. Lately I have come across situations where the quality of the music played on our PA systems has been poor. Where I asked the question, where did you get the music file from, I get answers 3 & 4. 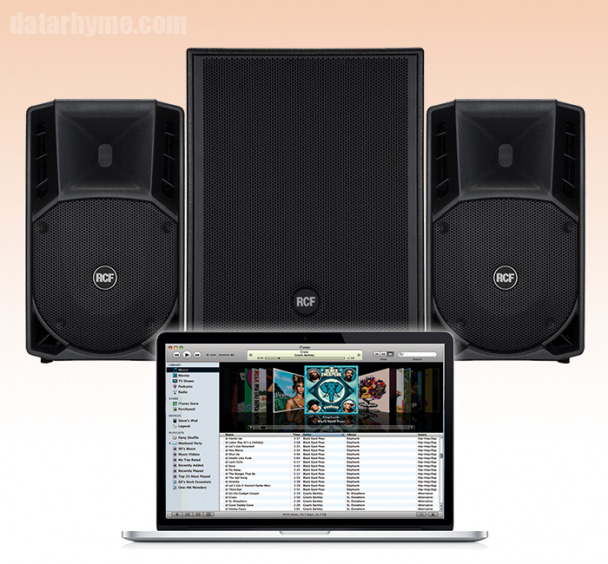 If you want high quality output from a high quality PA system, you must to use high quality music files. This will be an MP3 with a bit rate of 256kbps or higher or an AAC with a bit rate of 128kbps or higher. For reference, I’ve come across DJ’s that refuse to use compressed MP3 or AAC music files. They only use uncompressed WAV files to ensure ultimate sound quality. The downside of this is they have to contend with large files. Also, services like Spotify offer higher quality music files when you sign up to their monthly subscription giving you access to offline music.